We love Signature Dining! Enjoying fancy food on a date night is something we do a few times a year for special occasions. Our quick trip to Disneyland, celebrating my birthday, was definitely a reason to try Disneyland's Signature Restaurant at the Grand Californian Hotel by Chef Andrew Sutton. 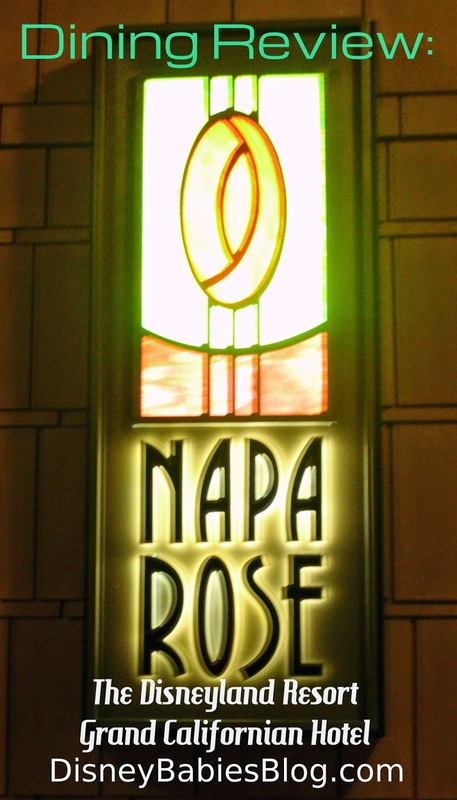 Award winning Chef, Andrew Sutton, was recruited by Disney in 2000 to create the signature restaurant for the resort, which turned into Napa Rose. They wanted a destination restaurant and Chef Sutton has definitely done that. He is also the head chef at Carthay Circle, the newest restaurant in California Adventure, and also Club 33, the VIP members only restaurant located inside of Disneyland Park! Inspired to be "Upscale Californian fare with an extensive wine list" the hardest part of dining here is deciding what to eat! The menu is constantly changing with seasonal fare "inspired by California’s bounty of produce, meat, game, poultry, seafood and farm-fresh specialty ingredients." We started with a glass of wine (for me), beer (for him), complimentary bread basket (delicious), and by splitting the seasonal roasted tomato soup. They split the soup for us in the kitchen so that we both had our own mug! It's not often my husband asks for soup, but we both enjoyed that indulgent! Grilled Filet of Angus Beef Tenderloin - Grilled Asparagus, Asparagus Coulis and Tomato-Cabernet Vinaigrette. It was better than expected. We have become accustomed to eating fresh organic grass fed beef and the fresh flavors that can have - this was better than anything we have ever made at home! I don't always love/crave steak, but I'm sure glad I was that night! Adam chose the rack of lamb - not my thing, but he said it was perfect! Green Garlic Crusted Colorado Rack of Lamb - Slowly Braised Lamb Breast and California Coastal Mushroom Ragu. And, we just had to split an order of the truffled mac & cheese. Why? Because when you are in a fine dining experience and they offer truffle mac n cheese, you have to. It's the rule. A month later I'm drooling at the thought of it! Adam ordered *what I think was* the Bananas Foster Creme Brulee - it was also fabulous, but for my money, chocolate gooeyness is always the way to go! 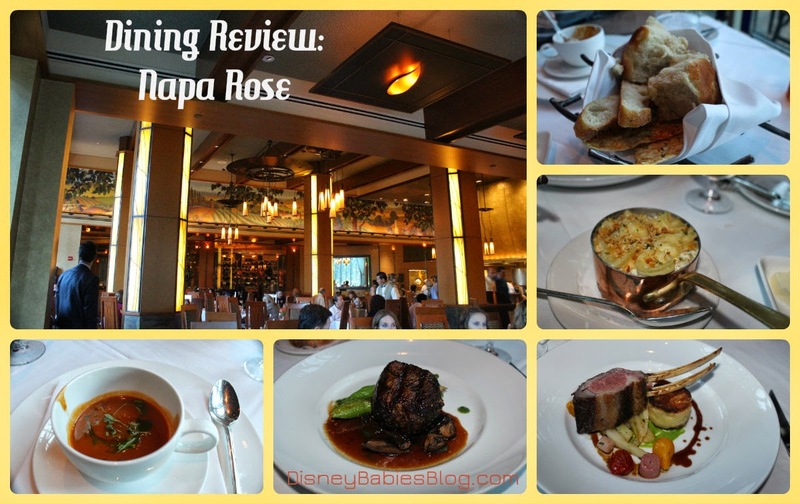 Napa Rose is an incredible restaurant and I would absolutely eat there again, assuming we have a babysitter! Kid friendly or not, this is a date restaurant - or maybe older kids/teens! It's not exactly quiet, but too expensive to waste money on small children! Now I am hungry! What a great review, the steak looks awesome.